This translation is based upon the text of MS Urb. 1 and the copyright is held by C. M. M. Brady. No use of this translation may be made without the author’s permission. If you have any corrections or comments please contact the translator at cbrady@targuman.org. 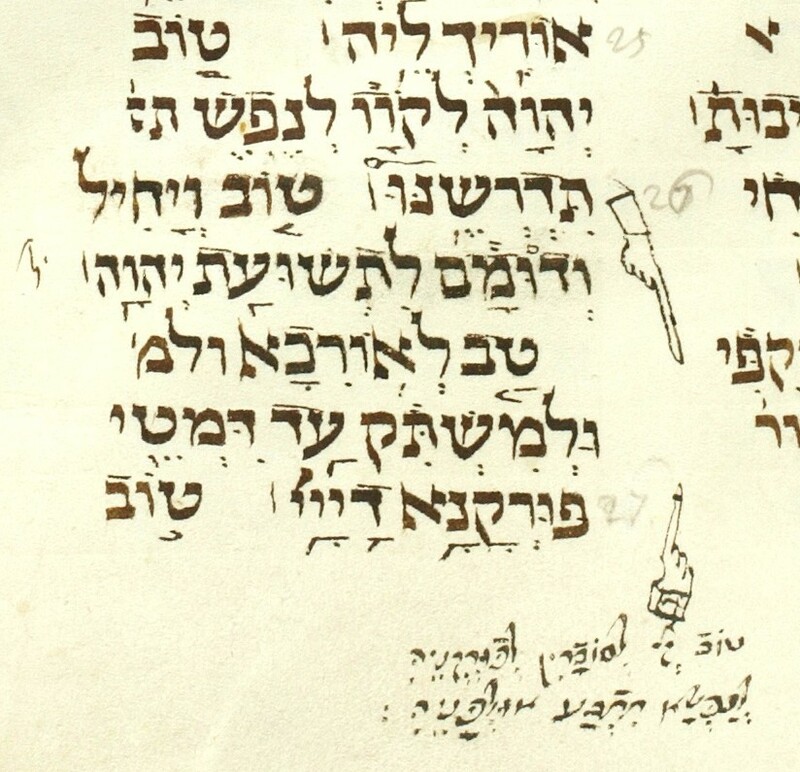 The portions of the translation presented in italics represent those words deemed by the translator to have been additions to the underlying Hebrew text (the MT) upon which the targumic version was based. 2 When Moses the Prophet sent messengers to spy out the land, the messengers returned and gave forth a bad report concerning the land of Israel. This was the night of the ninth of Ab. When the people of the House of Israel heard this bad report which they had received concerning the land of Israel, the people lifted up their voice and the people of the House of Israel wept that night. Immediately the anger of the LORD was kindled against them and he decreed that it should be so in that night throughout their generations over the destruction of the Temple. When it was told through prophecy to Jeremiah the High Priest that Jerusalem would be destroyed at the hand of the wicked Nebuchadnezzar unless they repented, he immediately entered and rebuked the people of the House of Israel, but they refused to accept it. Therefore the wicked Nebuchadnezzar came and razed Jerusalem and set fire to the Temple on the ninth day in the month of Ab. On that night, the Congregation of Israel wept bitterly and her tears flowed down her cheeks. There was no one to speak comfortingly to her heart from among all her idols after whom she loved to follow. As a result, all her friends were wicked to her; they turned against her and became her enemies. 3 The House of Judah went into exile because they were oppressing the orphans and the widows and because of the great servitude to which they were subjecting their brothers, the sons of Israel, who had been sold to them. And they did not declare freedom to their servants and handmaids who were of the seed of Israel. As a result they themselves were delivered into the hand of the nations. And the Congregation of the House of Judah dwells among the nations and finds no rest from the hard labor to which they subject her. [All who pursued her overtook her]1 as she was hiding in the border regions and they persecuted her. 4 All the while that Jerusalem was built, the sons of Israel refused to go up to be seen before the LORD three times a year. Because of Israel’s sins Jerusalem was destroyed and the roads to Zion are made mournful, for there is no one entering her at the time of the festivals. All the gates are desolate and her priests groan because the sacrifices have ceased. Her virgins mourn because they have stopped going out on the fifteenth of Ab and on the Day of Atonement (which is on the tenth day of Tishri) to dance the dances. Therefore she too is very bitter in her heart. 5 Those who oppress her were appointed over her as leaders and her enemies were dwelling at ease since the LORD had broken her due to her great rebelliousness. Her children go before the oppressor into captivity. 6 All the glory of the Congregation of Zion has gone out from her. Her nobles were wandering for food, like stags who wander in the desert and find no suitable place for their pasture. They went out in great weakness and they had no strength to flee to safety (from) before the pursuer. 7 Jerusalem remembered the days of old, when she was surrounded by walled cities and strong open towns, rebelling and reigning over all the earth, and all her lovely things which she had in earlier times. But because of her sins, her people fell into the hands of the wicked Nebuchadnezzar and he oppressed them and there was no one to save her. The persecutors watched her go into captivity and they laughed because her good fortune had ceased from her. 8 Jerusalem sinned a great sin, therefore she has become a wanderer. All the nations that had honored her in earlier times treat her with contempt for they have seen her nakedness. But she groans and shrinks back. 9 The impurity of the menstrual blood in her skirts has not been cleansed from her. And she did not regret her sins, nor did she think of what would befall her in the end of days. And she went down and fell and was set aside. And there was no one to speak comfortingly to her. Look, O Lord and see for my enemies have exalted themselves over me. 10 The wicked Nebuchadnezzar stretched out his hand and drew forth his sword and cut off all her lovely things. Indeed, the Congregation of Israel began to howl for she saw foreign nations go into her Temple; those about whom you commanded by Moses the prophet concerning Ammon and Moab, that they were not worthy to enter your assembly. 11 All the people of Jerusalem groan from hunger and search for bread to eat. They gave their precious things for the sustenance of bread in order to stay alive. Look O Lord and see for I have become voracious. 12 I adjure you, all who pass by on the road, turn around here. Look and see. Is there any pain like my pain, that which has been visited upon me because the Lord shattered me in the day of his great anger? 13 From heaven he sent fire into my strong cities and conquered them. He spread a net for my feet. He caused me to shrink back before my enemies. He caused me to be desolate all day, unclean and weak. 14 The yoke of my rebellion was heavy in his hand. Intertwined like the tendrils of a vine, they climbed upon my neck. My strength is weakened. The Lord has given me into the hands of one whom I cannot withstand. 15 The Lord has crushed all my mighty ones within me; he has established a time against me to shatter the strength of my young men. The nations entered by the decree of the Memra of the Lord and defiled the virgins of the House of Judah until their blood of their virginity was caused to flow like wine from a wine press when a man is treading grapes and the wine of his grapes flows. 17 Zion spreads out her hands from anguish like a woman spread upon the birth stool. She screams but there is no one to speak comfortingly to her heart. The Lord commanded the House of Jacob to keep the commandments and Torah, but they transgressed the decree of his Memra. Therefore his oppressors completely encircle Jacob. Jerusalem is like an unclean woman amongst them. 18 The Lord told the people of the House of Israel that they should not allow those who kill by the sword to pass through their land. Josiah the king went forth and drew his sword against Pharaoh the Lame on the plain of Megiddo, which he had not been commanded [to do] and he had not sought instruction from before the Lord. Therefore archers shot arrows at King Josiah and he died there. Before his spirit left him he moved his lips and said, “The Lord is blameless for I have transgressed against his Memra.” Hear now all peoples, the lamentations that Jeremiah made over Josiah and see my affliction that has come upon me after his death. My virgins and young men have gone into exile. 19 Jerusalem said, when she was delivered into the hand of Nebuchadnezzar, “I called to my friends, the sons of the nations, with whom I had made treaties to come to my aid. But they deceived me and turned to destroy me. (These are the Romans who entered with Titus and the wicked Vespasian and they built siege works against Jerusalem.) My priests and my elders within the city perish from hunger, because they searched for the sustenance of bread for themselves to eat, in order to preserve their souls. 20 “Look, O Lord, for I am in anguish. Therefore my bowels are piled up and my heart turns within me, for I have surely transgressed the decree of the Memra of the Lord. Consequently, outside the sword bereaves and inside the agony of starvation, like the Destroying Angel who is appointed over death. 21 “The nations heard that I am groaning and there is no one to comfort me. All my enemies heard of the evil that overcame me and were glad. For you Lord are the one who has done it. You have caused them to bring upon me a day of retribution. You have summoned against me a coalition to destroy me. May you summon against them that they may be made desolate like me. 1 How the Lord has detested the Congregation of Zion in his fierce anger. He threw down from the heavens to the earth the glory of Israel and he did not remember the Temple that was his footstool nor did he spare it in the day of his fierce anger. 2 The Lord destroyed and did not spare any of the choice dwellings of the House of Jacob. In his anger he destroyed the Congregation of the House of Judah and brought them to the ground. He broke the kingdom, crushed her leaders. 3 In his fierce anger he cut off all the glory of Israel. He drew back his right [hand]3 and did not help his people from before the enemy and he burned in the House of Jacob like a searing fire which consumes on all sides. 4 He drew his bow and shot arrows at me like an enemy. He stood ready at the right of Nebuchadnezzar and aided him as if he were oppressing his people, the House of Israel. And he killed every young man and everything that was beautiful to see. In the tent of the Congregation of Zion he poured out his anger like a burning fire. 5 The Lord has become like an enemy. He destroyed Israel. He destroyed all her forts and razed all her open cities. He has increased in the Congregation of the House of Judah mourning and grief. 6 He uprooted his Temple like a garden. He razed the place appointed for the atonement of his people. The Lord has caused the joy of the festival and the Sabbath to be forgotten and in his fierce anger he hates the king and high priest. 7 The Lord has abandoned the house of his altar. He has trampled his Temple. He has handed over the walls of the forts to the enemy. They raised a shout in the Temple of the Lord like the shout of the people of the House of Israel praying in it on the day of Passover. 8 The Lord resolved to destroy the wall of the Congregation of Zion. He swung the plummet and did not turn back his hand from destroying it. He caused the rampart and the wall to mourn; they were destroyed together. 9 Her gates have sunk into the earth because they slaughtered a pig and brought its blood over them. He has destroyed and shattered her doorposts. Her king and rulers were exiled among the nations because they did not keep the decrees of Torah, as if they had not received it on Mount Sinai. Even her prophets had the holy spirit of prophecy withheld from them and they were not told a word of prophecy from before the Lord. 10 The Elders of the Congregation of Zion sit on the ground in silence. They throw wood ashes upon their heads. They gird sackcloth upon their bodies. The virgins of Jerusalem bow their heads to the dust of the earth. 11 My eyes are spent with tears, my bowels are piled up, my liver is spilt onto the ground because of the destruction of the Congregation of my people as youths and infants cried out in the open places of the cities. 12 The young men of Israel ask their mother, “Where is the bread and wine?” as they thirst in the same way as one wounded by the sword [suffers] from thirst in the open places of the cities, as their life is poured out from hunger into their mother’s bosom. 13 What can I bring to bear witness to you? Or to what can I compare you, O Congregation of Jerusalem? How shall I befriend you that I may console you, O Virgin of the Congregation of Zion? For great is your breaking, as great as the breaking of the waves of the Great Sea during the season of their gales. And who is the doctor who can heal you of your affliction? 14 The false prophets within you, they have seen falsehood for you and there is no substance to their prophecies. Nor did they make known the punishment that would overtake you as a result of your sin, in order to make you turn back in repentance. Rather, they prophesied to you vain prophecies and erring words. 17 The Lord has done what he planned. He completed the Memra of his mouth that he commanded to Moses the prophet long ago: that if the children of Israel did not keep the commandments of the Lord he was going to punish them. He destroyed and had no mercy. He has caused the enemy to rejoice over you for he has exalted your oppressors. 18 The heart of Israel cried out before the Lord, to have mercy on them. O wall of the city of Zion, weep tears like a torrent day and night. Give no comfort to your sorrows, to slacken in the prayer that is yours. May your eyes not cease from weeping. 19 Arise, O Congregation of Israel dwelling in exile. Busy yourself with Mishnah in the night, for the Shekinah of the Lord is dwelling before you, and with the words of Torah at the beginning of the morning watch. Pour out like water the crookedness of your heart and turn in repentance. And pray in the synagogue before the face of the Lord. Raise your hands to him in prayer for the life of your children who thirst with hunger at the head of every open market. 21 The young and the old who were accustomed to recline on pillows of fine wool and upon ivory couches were prostrate on the earth of the open markets. My virgins and youths have fallen, killed by the sword. You have killed in the day of your anger; you have slaughtered and shown no pity. 22 You will declare freedom to your people, the House of Israel, by the hand of King Messiah just as you did by the hand of Moses and Aaron on the day when you brought Israel up from Egypt. My children will gather all around, from every place to which they had been scattered in the day of your fierce anger, O Lord, and there was no escape for them nor any survivors of those whom I had wrapped in fine linen. And my enemies destroyed those whom I had raised in royal comfort. 1 I am that man who has seen affliction by the rod that chastises in his anger. 2 He has led and brought me to darkness, and not to light. 3 Indeed, against me he will turn, heaping upon me his blows all day. 4 My flesh is worn out from beatings, my skin from the blow. He has shattered my bones. 5 He has built siege works and surrounded the city. He has uprooted the heads of the people and wearied them. 6 He has caused me to dwell in a dark prison like the dead who have gone to the other world. 7 He has locked me in so that I cannot go out from the prison. He has put heavy brass fetters on my feet. 8 Even when I cry out and pray the house of my prayer is blocked. 9 He has closed my paths with hewn marble stones. He has confounded my paths. 10 He is a bear lying in wait for me, a lion hiding in a hallow. 11 He has confounded my path and rent me. He has made me desolate. 12 He draws his bow and has set me as a target for the arrow. 13 He made the arrows of his quiver enter my vitals. 14 I have become a laughing stock to all the degenerate of my people; they mock me in song all day. 15 He has sated me with gall of snakes and made me drunk with wormwood. 16 And he crushed my teeth with gravel; he has pressed me into ashes. 17 And my soul shrinks from asking for peace; I have forgotten goodness. 18 And I said, “My strength is destroyed and the goodness which I had longed for from before the Lord. 20 My soul surely will remember and bow down within me due to affliction. 22 The goodness of the Lord, for his mercies do not end nor have they ceased. 23 He brings forth new wonders in the mornings; great is your faithfulness. 24 “The Lord is my portion,” says my soul; therefore I will hope in him. 25 The Lord is good to those who hope for his salvation; to the soul who seeks his instruction. 26 It is good to wait and be silent until the salvation of the Lord comes. 27 It is good for a man to train his soul to bear the yoke of the commandments in his youth. 28 Let him sit alone and be silent, bearing the corrections which have come upon him, for the sake of the unity of the name of the Lord, which have been sent to punish him for the minor sins which he has committed in this world, until he have mercy upon him and lift them from him so that he may receive him perfected in the world to come. 29 Let him put his mouth to the dust and prostrate himself before his master perhaps there is hope. 30 Let him turn his cheek to the one that smites, for the sake of the fear of the Lord, let him be filled with insult. 31 For the Lord will not neglect his servants forever, giving them over into the hand of their enemy. 32 But first he breaks and afterwards he repents and has mercy on the righteous in the abundance of his goodness. 33 For since man did not afflict his soul nor removed arrogance from his heart, therefore he caused destruction to come upon the sons of men. 36 Confounding a poor man in his quarrels; is it possible that this will not be revealed before the Lord? 37 Who is the man who has spoken and an evil thing had been done in the world, unless because they did that which they were not commanded by the mouth of the Lord? 38 From the mouth of God Most High there does not issue evil, rather by the hint of a whisper, because of the violence with which the land is filled. But when he desires to decree good in the world it issues from the holy mouth. 39 What profit shall a man find who sins all the days of his life; a wicked man for his sins? 40 Let us search and examine our ways; and turn in repentance before the Lord. 41 Let us lift our cleansed hearts and cast away theft and robbery from our hands. And let us repent before God the dwelling of whose Shekinah is in heaven above. 42 We have rebelled and been disobedient and since we did not return to you, you have not forgiven. 43 You have covered us in anger and pursued us in exile. You have killed and have not pitied. 44 You have covered the heavens with your clouds of glory so that our prayers cannot cross to you. 45 You have made us like wanderers and vagabonds among the nations. 46 All our enemies have opened their mouths against us, to announce evil decrees against us. 47 Panic and fear have come upon us because of them, trembling and destruction have seized us. 48 Like streams of water my eyes flowed with tears because of the destruction of the Congregation of my people. 50 Until the Lord looks out and sees my humiliation from heaven. 51 The weeping of my eyes is the cause of the affliction of my soul over the destruction of the districts of my people and the humiliation of the daughters of Jerusalem, my city. 52 My enemies, without cause, laid a trap for me like a bird. 53 They caused my life to pass in the pit and cast stones at me. 55 I prayed to your name, O Lord, from the depths of the pit. 56 You received my prayer at that time, and now do not cover your ears from receiving my prayer to give me relief because of my plea. 58 You have fought, O Lord, against those who made a quarrel with my soul. You delivered my life from their hands. 59 You have seen, O Lord, the wrong by which they wronged me. Judge my case. 60 All their vengeance has been revealed before you, all their evil plans against me. 61 Their taunts were heard before you, O Lord, all their evil plans against me. 62 The lips of the enemies are against me and their mutterings are against me all day. 63 Look at their sitting and rising! I am [the object of] their taunt-songs. 64 May you return to them evil recompense, O Lord, according to the works of their hands. 65 May you give them brokenness of heart and may your weariness wear them out. 66 Pursue them in anger and destroy them from under the high heaven of the Lord. 1 How the gold of the Temple has dimmed, the choice gold leaf has changed! The sacred jewels are scattered at the head of every street. 2 The precious sons of Zion which were comparable in their appearance to that of fine gold, how the unclean people brought them down near to their beds and stare at them, so that their wives might bear sons as beautiful as they and they are considered as [clay] vessels the work of the hands of the potter. 3 Even the pampered daughters of Israel untie their breasts to the nations who are like the basilisk. And the young men of the Congregation of my people are handed over to cruel men and their mothers mourn over them like ostriches in the desert. 4 The tongue of the youth clings to his palate from thirst. Children ask for bread, but there is no one who offers it to them. 5 Those who used to eat delicacies were desolate in the markets. Those who were reared in the color crimson embrace dunghills. 6 The sin of the Congregation of my people is greater than the sin of Sodom that was overthrown in a moment. And no prophets were left in her to prophesy, to turn her back in repentance. 7 Her Nazarites were purer than snow, smoother than milk. Their appearance was ruddier than crimson and their faces like sapphires. 8 Their appearance was darker than the blackness of the exile; they were not recognized in the markets. Their skin clung to their bones; brittle as a twig. 9 Better were those who were slain by the sword than those who were slain by hunger, for those slain by the sword perished when pierced in their bellies because they ate of the gleanings of the field; and those who were bloated from hunger; their bellies burst from food. 10 The hands of women who were merciful towards the poor boiled their young, they became sustenance for them when the day of famine broke, when the Congregation of my people was destroyed. 11 The Lord has finished his anger; he has poured out his fierce wrath upon Jerusalem and he has brought up a raging fire in Zion, and it consumed her foundations. 12 The kingdoms of the earth did not believe, nor did those who dwell in the world, that the wicked Nebuchadnezzar and Nebuzaradan the enemy would enter to slaughter the people of the House of Israel in the gates of Jerusalem. 14 The blind wandered about in the markets, defiled with the blood of those slain by the sword and since they could not see they touched their clothes. 16 They were dispersed from before the face of the Lord, he no longer regarded them. Therefore the wicked peoples did not respect the priests nor did they spare the elders. 17 Our eyes still fail to see our help which we expected to come from the Romans, but which turned to naught for us. In hope we watched for the Edomites who were a nation that could not save. 18 They prowled our paths so that we could not walk safely in our open places. We said, “Our end is near; our days are fulfilled,” for our end had come. 19 Our pursuers were swifter than the eagles of the heavens; unto the mountains they chased us, in the desert they lay in wait for us. 21 Rejoice and be of good cheer Constantinople, city of wicked Edom, which is built in the land of Armenia with crowds from the people of Edom. Retribution is about to come upon even you, and the Parkevi will destroy you and the accursed cup shall pass to you and you shall become drunk and exposed. 22 And after this your iniquity will be finished, O Congregation of Zion and you will be freed by the hands of the King Messiah and Elijah the High Priest and the Lord will no longer exile you. And at that time I will punish your iniquities, wicked Rome, built in Italy and filled with crowds of Edomites. And the Persians will come and oppress you and destroy you because your sins have been made known before the Lord. 1 Remember, [O Lord], what was decreed to befall us; look from heaven and see our disgrace. 2 Our inheritance has been turned over to strangers; our house to foreign peoples. 3 We have become like orphans who have no father, our mothers like widows whose husbands have gone into the cities of the sea and it is uncertain if they are alive. 4 We drink our water for money and our wood comes at a price. 5 Upon the bone of our necks we were laden when we went into exile. The wicked Nebuchadnezzar saw that the commanders of the Israelites were going without any load [and] he ordered that they sew Torah scrolls and make sacks out of them. And they filled them with pebbles from the edge of the Euphrates and they loaded them upon their necks. At that time we were tired and there was no rest for us. 6 We gave support to Egypt so that we might be sustained there and to Assyria so that we might have enough bread. 7 Our fathers sinned and are no longer in the world, but we have borne their iniquities after them. 8 The sons of Ham, who were given as slaves to the sons of Shem, ruled over us and there was no one to deliver us from their hands. 9 At the risk of our lives we gather bread to sustain us from before the slaying sword that comes from across the wilderness. 10 Our skin has become black like an oven, because of the exhaustion of starvation. 11 Women who were married to men in Zion were raped by Romans and virgins in the cities of Judah by Chaldeans. 12 Princes were impaled by their hands and the faces of the elders they did not respect. 13 The young men carried millstones; and the boys staggered under the beam of wood. 14 The elders ceased from the gates of the Sanhedrin; and the young men from their houses of music. 15 The joy of our hearts has ceased; our dancing has turned into mourning. 16 The crown of our head has fallen; Woe to us! for we have sinned. 17 Because of our Temple, which is desolate, our heart was weak. And because of these people of the House of Israel who went into exile from there our eyes have become dim. 18 Because of Mount Zion which is desolate; foxes prowled on it. 19 You are the Lord. Forever your dwelling place is in the heavenly heights. Your glorious throne is from generation to generation. 20 Will you forget us forever and forsake us for a long time? 21 Restore us, O Lord, to yourself and we will return in complete repentance. May you renew our days for good as the festival days of old. 22 For you have utterly loathed us; you have been extremely angry with us. Found in Solger and necessary in order to represent all of MT.